Stress urinary incontinence is leakage of urine with physical stress, such as coughing, laughing, or sneezing. It is a common problem for women. Sometimes it can be treated successfully without surgery. At other times, surgery may be the best treatment. 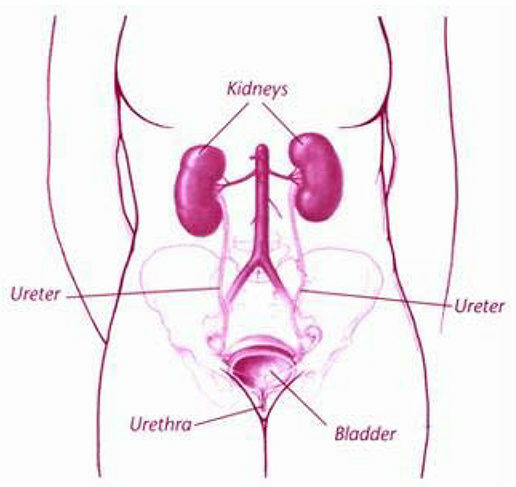 The urinary tract is made up of the kidneys, ureters, bladder, and urethra. It may take a while for the bladder to adapt to the new position after surgery. Bladder spasms can occur during recovery. This happens when the muscles contract and relax in waves. When the bladder heals, they usually stop, but some women may develop longterm spasms after surgery. Medication can help control the spasms. Keep the pelvic muscles strong by doing Kegel exercises regularly (see below). Be careful not to squeeze the muscles of the leg, buttock, or abdomen. Do these exercises on a regular basis. After 6–12 weeks, you should be able to hold your urine better.